Shep is a 9 yr old shepard mix that has been at Orphans of the Storm, a No Kill animal shelter, located in Kittanning, PA (45 mins north of Pittsburgh, PA) for more than 3 years now. UPDATE: Shep is now 10 years old, and has spent 4 years in the shelter. Let’s get him out NOW! He was a stray that wandered in and adopted a family who fell in love with him, but he didn’t get along with their other male dog. This friendly guy is good natured and loves walking with the volunteers. Get Shep Adopted – Shep is a 9 yr old Shepard mix looking for his forever home. Shep doesn’t always get along well with other male dogs. But a household where he could be the only dog, or the only male dog, would be perfect. He does need regular ear cleanings. He seems to be house-trained, and is very laid back. And he would desperately love a home of his own to live out his twilight years. Being black, big and older he often gets over-looked by potential adopters. His adoption fee has been paid already by generous donors, all he needs is the right family to fall in love with him. Do you have it in your heart to give Shep the forever home of his dream? If so contact Orphans of the Storm at 724-548-4520. 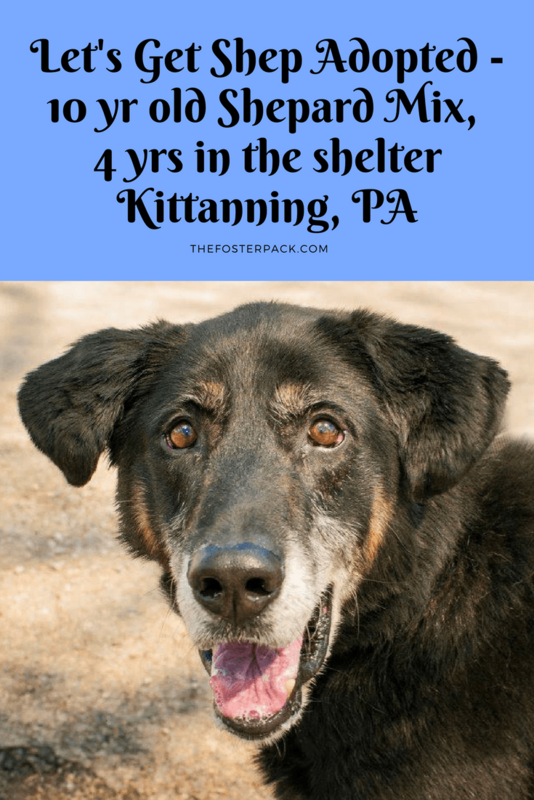 Know of a long term shelter animal? As a foster mom for a local No Kill shelter, I’ve seen first hand the differences between a dog when he’s in a shelter, as to in a loving home. And there is a big difference! I hate to see animals spend a long time at the shelter. Patiently waiting for the perfect forever family to find them. And nothing makes us happier than knowing a dog that has spent months or even years at a shelter has finally found his/her forever home. So here is our first post to get some of these long term shelter dogs adopt. I’m hoping to turn it into a regular series, so if your shelter, or animal rescue has some long term shelter animals email us at: mamaminion @ thisdomain and we’ll do a write up on them too!